GTIAdmin – Golf Tournaments Inc.
1. Talk to your biggest event partner – the golf course – about this year’s tournament and how you can work together to improve the event for next year. For example, if the pace of play was too slow this year, review with the golf course staff how you can improve upon that aspect of the tournament in 2018. 2. Keep the event fresh and interesting particularly if it is a long standing tournament. Consider adding one or two new elements to the event that will enhance the golfer’s experience that day and link their enjoyment with your charity. You might want to add in a pre-tournament golf clinic or a golf club demonstration from a leading manufacturer (e.g. Titleist, Callaway, TaylorMade) on the driving range. 3. Recognize your most loyal supporters : at the 2018 tournament publicly acknowledge those golfers and sponsors who have been supporting the tournament for 5, 10 or 15 years. 4. Use social media tools like Twitter, Facebook , Instagram, etc. to both promote your event in advance and to report on the tournament as it occurs. 5. Golfer gifts : many tournaments provide a significant golfer gift at registration which is a great idea. But you can enhance the experience by thanking your golfers with an additional small golfer gift as they play through a particular hole or as they come off the golf course. Have a senior volunteer or staff person from your organization on hand to personally greet and thank these loyal supporters. Best of luck to all charity golf tournaments in 2018. 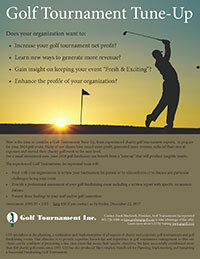 Learn how to plan and run a great fundraising golf tournament for your group or organization! This comprehensive handbook is only $75.00 plus applicable taxes. SPECIAL OFFER – Purchase the Golf Tournament Handbook and receive a free 30 minute telephone consultation with Frank MacGrath to discuss your tournament. View the first 3 pages of the Handbook including the Table of Contents. We even provide sample marketing materials for your convenience. Don’t delay – make this year’s fundraising or team-building event your best ever!